It's time for another installment of design ideas from Karen Chapman and Christina Salwitz, the Seattle-based authors of Fine Foliage. It’s time for another installment of design ideas from Karen Chapman and Christina Salwitz, the Seattle-based authors of Fine Foliage. Scallywag holly is the mischief-maker of this combo, threatening to poke those who come too close. Despite its threat of mischief, however, this dwarf holly is actually not too prickly at all. Its dark burgundy foliage adds high contrast to the buttery tones found in the hebe while echoing its subtle purple tints. Rosy berries and velvety ‘Fire Alarm’ heuchera raise the temperature while ‘Blue Star’ juniper cools it down. Finally, the soft and most definitely NOT prickly, ‘Rheingold’ arborvitae will glow amber soon as colder weather arrives, adding another layer of color. Scallywag holly (Ilex x meservae ‘MonNieves’) – a relatively new introduction, this dwarf holly is sure to become a favorite. 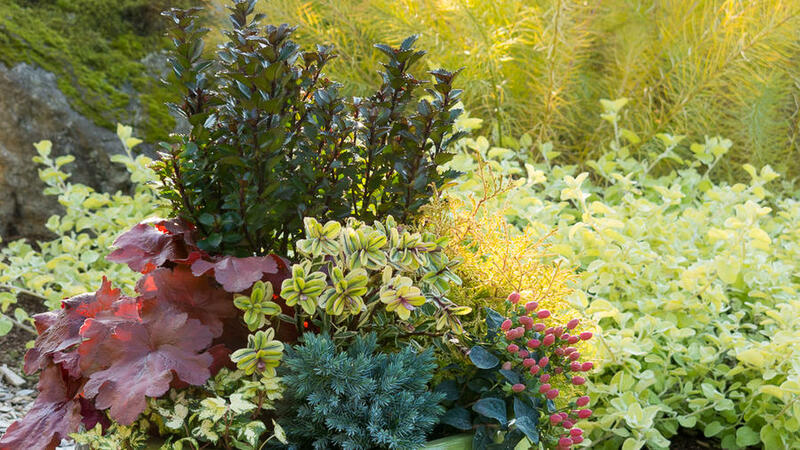 The glossy dark green foliage takes on deep burgundy tones in winter, making it a striking addition to containers or the landscape – and just look at those black stems! Totally drool worthy. To 4’ tall and 3’ wide. Sunset Climate Zones 3-9, 14-17. ‘Fire Alarm’ coral bells (Heuchera ‘Fire Alarm’) – this evergreen perennial is a real attention seeker. Moving through spring shades of vibrant red-orange to more subtle dusky tones in fall it has something to offer in every season. Makes a leafy 14” mound and is hardy in Sunset Climate Zones 1-9, 14-24. Variegated hebe (Hebe ‘Variegata’) – variegated foliage is invaluable in design and this compact shrub also offers purple blooms in summer for those who need their flower fix. Evergreen in zones 7-9 but enjoy it as an annual if you live in colder areas. It will grow to 2-3’ tall and wide. Sunset Climate Zones 14-24. ‘Blue Star’ juniper (Juniperus squamata ‘Blue Star’) – it always surprises me how this steel blue foliage is effective in so many color schemes. Young plants like this are wonderful additions to the front of containers where they will mound gently over the edge. Since they are slow growing they can be enjoyed for several seasons although in time it will grow to 2-3’ tall and 3’ wide. Olivia St. John’s wort (Hypericum ‘Hypearls Olivia’) – berries are a great addition to any container combination and this is a great one for fall designs. Buttercup yellow flowers are followed by rosy, bullet shaped fruit which remain for several months and the blue-green leaves are the perfect foil. This deciduous shrub will eventually grow to 3’ tall and wide and is best trimmed in late winter. Sunset Climate Zones 1-24. ‘Rheingold’ arborvitae (Thuja occidentalis ‘Rheingold’) – a tufty mounding conifer in a unique shade of copper, this under-utilized evergreen adds great color and texture to the landscape or containers. It will eventually grow to 4’ tall x 3’ wide. Sunset Climate Zones A2, A3; 1-9, 15-17, 21-24; H1, H2. Variegated ivy (Hedera helix) – if you are going to use ivy restrict it to a container, trim the length as necessary and root prune it in fall to stop it taking over! With that caveat this is a great plant to add a little sparkle to containers. Sunset Climate Zones 3-24, H1.